Stool #7: White Oak with center walnut strip and two stripes inside each edge with rounded legs and a bevel edge on top. 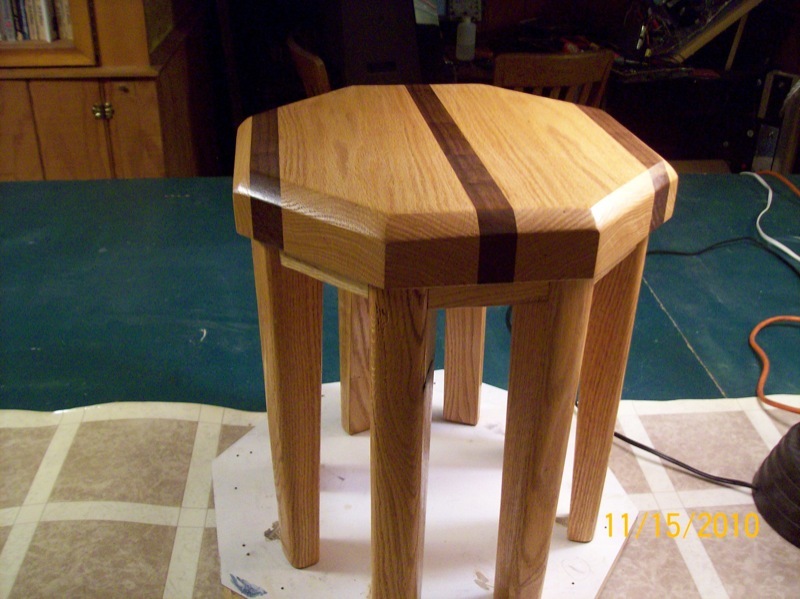 I 'messed up' more during the construction of this stool than any up to now (so this should be the most interesting yet). During the process I was beginning to think I was all thumbs and was loosing my mind. 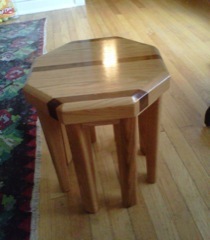 But in the process of 'correcting' the errors I ended up with a stool that I like very much. This is the first use I've made of some walnut I got from Roland taken from a tree in his back yard. It isn't as red as the wood from my wood pile but it is still dramatic when placed next to the white oak. One of the mistakes I made with this stool was trying to do the round over in a single pass. Of course the wood chipped out where I went across the end grain and on the angled sides. I fixed this by simply cutting a 45 degree bevel over the round-over. This cut out almost all the gouges - the rest I could fix with sandpaper. Another mistake I mad was to put in the biscuits too close to the edge of the square blank assembly. When I cut out the angle pieces for the octagon it exposed the biscuits. I had to re-saw the joints and cut back far enough to remove all traces of the bus quits. 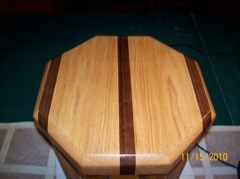 This left me short - even with the walnut - so I filled in the width with some more white oak. I kind of like the result, don't you? It's hard to part with something that you put your heart and soul into building. But when Emily; a close friend of ours moved to Chicago from New York, it seemed like a stool would be a welcome addition to her new apartment. And my wife reminded me that seven stools in our living room is a little bit of style overkill. It took a few days but once I got used to the idea, I began thinking of our son, Lance - who had recently divorced and had moved to a new apartment in Chicago as well. So we packed two stools into the car and headed to Chicago. I rationalized my loss with the belief that both Lance and Emily would sufficiently appreciate the fact that these pieces of furniture were hand-made by someone they knew AND that they did not come from Ikea.